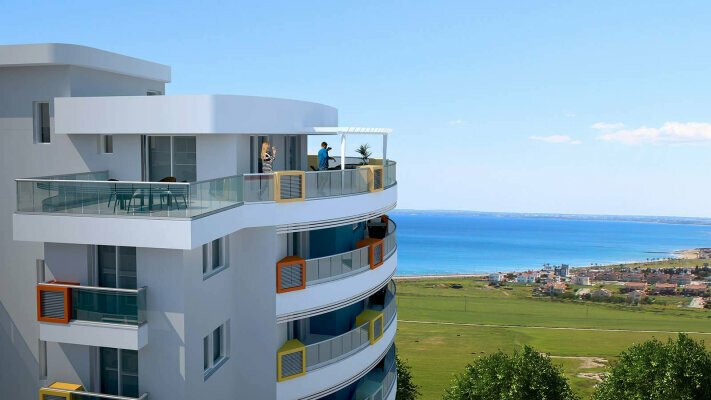 Studio-penthouse with amazing sea and mountain views/ Located in a new residential complex in just 200 meters away from one of the best sandy beaches in North Cyprus – Long Beach. Complex offers you sea-view apartments with spacious balconies, designed according to up-to-date architectural trends.With its indoor and outdoor swimming pools, walking paths, green areas, fitness-center and special areas for golf, complex guarantees high quality life style. The project consists of multi-purpose shops and 550 flats. Also it enables you to have access to variable apartment options such as studios, one-, two- and three-bedroom, with extensive closed areas and balconies, and a variety of quality entertainment, dining, sporting and resting places.